Shop the best selection of religious stickers online. 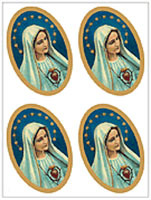 Choose from many Catholic & Christian themes including Mary, Jesus, popes, biblical scenes and saints. Use them for school activities, Religious Education Classes, or at home. Show your faith and paste a catholic sticker on letters to your friends and family. Kids absolutely love our stickers. Introduce your kids to Jesus, Virgin Mary, biblical figures and saints. Minimum Order Quantity: 2 Sticker Sheets.